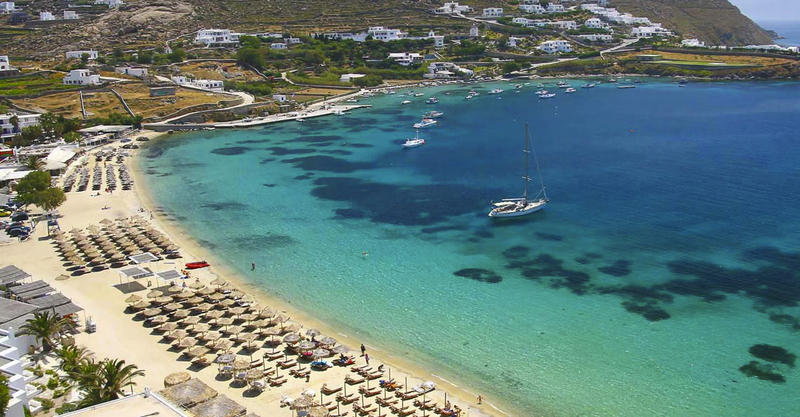 In only 2.5 km distance from Mykonos town, to the southwest, there is Ornos beach. Ornos beach is right in front of a small fishing village. It is one of the most popular beaches on the island, but over the high season can be really overcrowded. Fully organised, and a lot of good restaurants and taverns can be found there. A diving school, as well as ski school and windsurfing are also available. Some of the best hotels of the island are located around the beach. It is one of the few beaches that suggested as well for evening hours, as the restaurants and the beach bars stay open until late. Ornos is a wind protected beach, since this is very important for this windy island.